This past weekend, I attended an Al-Anon Round-Up, which was held on some of the most spiritual grounds I have ever set foot on. This is my third year attending the Round-Up at this location, and my favorite part of the weekend is walking the Labyrinth. The Labyrinth is an archetype, a divine imprint, found in all religious traditions in various forms around the world. By walking our replica of the Chartres Labyrinth, laid in the floor of Chartres Cathedral around 1220, you are rediscovering a long-forgotten mystical tradition that is insisting to be reborn. 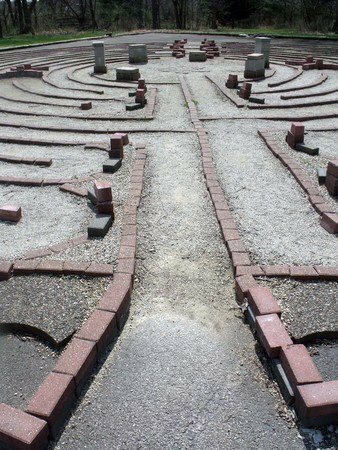 Walking the labyrinth is an ancient spiritual act and a physical meditation that is being rediscovered during our time. A labyrinth is an ancient circular diagram. It consists of a single concentric circular path with no possibility of going astray. The path winds throughout and becomes a mirror for where we are in our lives; it touches our sorrows and releases our joys. So walk it with an open mind and an open heart. Anyone from any tradition or spiritual path can walk into the labyrinth and benefit, through reflecting in the present moment. Honestly, I do not know the extent of what these messages mean; however, at face value they are a magical blueprint to live by. I suspect they tie into my Chakras in some way, but I will need to pray and meditate about these messages, before I can fully understand their significance. If you have any thoughts on what my Higher Power was trying to convey, please feel free to share your insights.